Don’t you hate it when the breading of your chicken tenders falls off as soon as it hits the steamy oil? I know I do! After some trial and error, I think I have it figured out. YAY!! Toss 1 lb. of chicken tenders into a bowl with 1 bottle of Frank’s Red Hot Sauce for at least 15 minutes to marinade. Combine Kikkoman Panko Bread Crumbs, flour, salt, black pepper, and Slap Ya Mama Seasoning in a pie dish. Remove chicken tenders from marinade and toss in batter mixture. 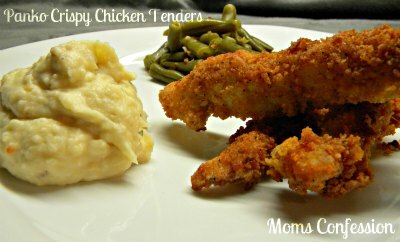 Coat chicken tenders, place in preheated oven at 350˚ and bake to crunchy perfection! If you choose to fry these panko chicken tenders, coat chicken tenders, place in preheated frying pan with oil, and fry to crunchy perfection! Serve with green beans mixed cooked with bacon bits and mashed potatoes. 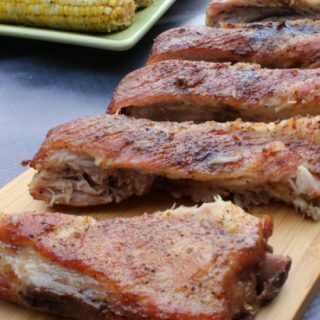 Dinner is served in 30 minutes! ty for the recipe going to try it now!